South Tampa Pilates incorporates the use of MVe Chairs to add variety and intensity to some of our "Mixed Apparatus" classes, including Teresa's famous Power Hour! MVe, better known as Maximum Versatility Exercise, is a fun, fast-paced workout that gets your heart rate up and increases your calorie burning efficiency. Launched from the professionals at Peak Pilates, this chair combines the elements of Pilates, cardio and strength to create a total body experience unlike anything else. Give your metabolism a jolt and reap the benefits of long, lean muscle mass and balanced strength with this versatile Pilates tool. The MVe Chair is perfect for all skill and ability levels and we encourage you to take your first class immediately. You will become addicted, that’s a guarantee. What are you waiting for? Try a class now! 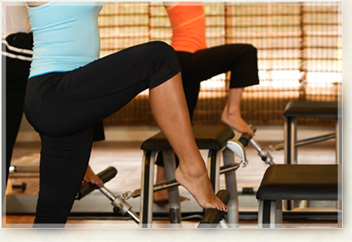 We want to welcome you to the future of Pilates and allow you to realize its benefits in an entirely new way.